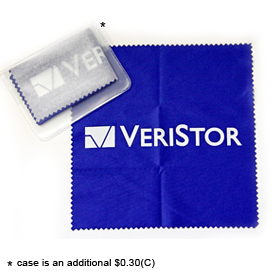 Microfiber cleaning cloths clean smudges from screens, lenses, cell phones, smart phones, tablets, monitors, cameras, lap tops, eyeglasses and even jewelry. You'll want one in the car, your purse, your desk, at home and in your eyeglass case. Microfiber Cleaning Cloths cleans without water or chemicals. CP-1000 - sublimated smooth material 6" x 6"
CP-1001 - screened smooth material 6" x 6"
CP-1100 - sublimated smooth material 5" x 4"
CP-1101 - screened smooth material 5" x 4"
1 color screen print or full color sublimated printing on one side of cloth. Choice of smooth or brushed material. Sublimation is sharper on smooth material. Stock smooth fabric colors are white, black, light gray, light blue, red, green, orange, pink and dark blue. Stock brushed fabric colors are white, black, light gray, light blue and dark blue. For reusable clear vinyl pouch, add 0.30(C). Choice of two sizes: 4-1/8" wide x 2-1/2" high, fits cloth and standard business size card (printed card additional cost) or 3-1/2" wide x 2-1/2" high. 50.00(G) plus set-up charge. The 50.00 (G) sample charge will be refunded when order is placed. Design changes will incur an additional charge. Overnight shipping charges apply. Pre-payment may be required. Adds 10 days to 2 weeks to delivery. 3 weeks after approval of artwork or pre-production sample. Pinnacle Prints Inc Great supplier! Have exceeded expectations on meeting rush deadlines with great quality of product! Customer was so happy he re-ordered same day!